A Readathon is occurring this week. The idea is to read some books that are not discussed very often online, via booktube, blogs, or goodreads. Of course, one can pick and chose how they define what an underhyped book is. I am running fast and loose with this idea. I also do not anticipate that I will be able to finish both of the books in this time period because I am reading another series at the moment and trying to sort out applications. I will put all the links for more information below. So I realize that neither of these authors are necessarily under-hyped. But let me start out with these points towards my justifications. 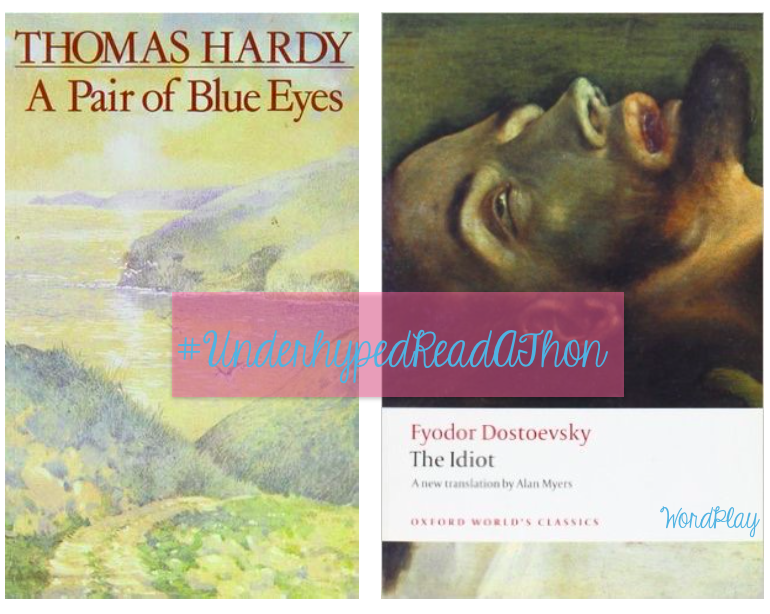 In the first case, Hardy’s book is rarely discussed amongst other classics. I do think Hardy has been brought into the spotlight due to this summer’s release of Far From the Madding Crowd, a film I have not yet seen. Yet, A Pair of Blue Eyes seems like a more obscure choice in the Hardy canon, so I am excited to read this particular text. Next, although Dostoevsky is often discusses, and, perhaps, his shorter works are read, I do think his longer texts are often overlooked. I have a special soft spot for Russian literature, especially of the kind that is critical of nineteenth-century Russia. Additionally, Sartre and Camus, French authors, are very regularly discussed as the pioneers of existentialism, but Dostoevsky, particularly this text, is a key moment in existential thought. I want to read more before I say more. I have always been a fan of existentialism; I prefer Sartre’s philosophy to his literature. In fact, he is a really great read to understand neo-colonialism and his avid advocation for the decolonization of Africa by France (and other European countries). Sartre will always have a huge place in my heart for this. Additionally, he and Simone de Beauvoir are perfect. So, I suppose in the niche of existentialism, I am trying to reclaim Dostoevsky and see where he fits in the movement. #Goals. I also want to note that the emaciated face on the cover of the book belongs to Christ. The full painting is The Body of the Dead Christ in the Tomb by Hans Holbein (yes, the same one who did the famous Henry VIII portrait). I will say more at a later date about Holbein’s place in existentialism by later generations of thinkers, such as Dostoevsky, due to his unique context of the Protestant Revolution. Hans Holbein, The Body of the Dead Christ in the Tomb, 1521. Let me know if you are doing this Read-A-Thon and/or what books you’re reading!